Updated 1:30pm 4/8/15: Updated Day 2 (Thursday) SPC outlook below. 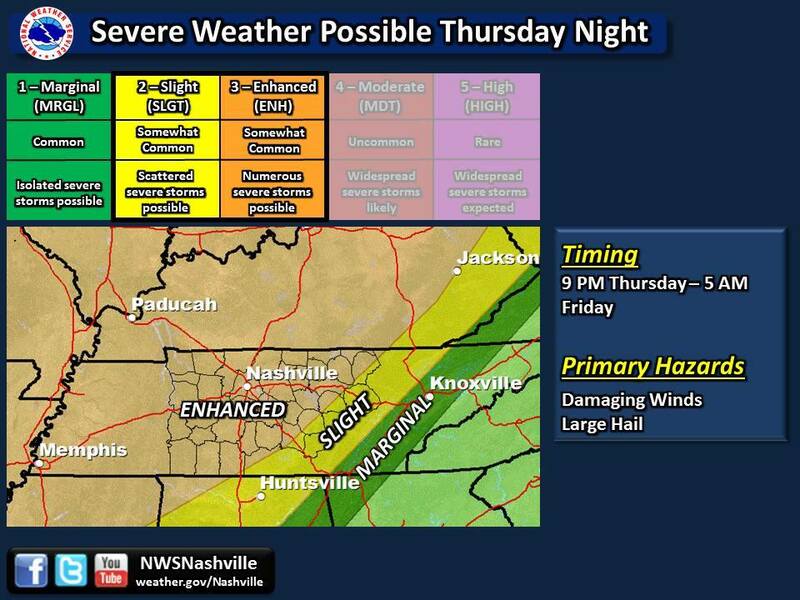 Also updated NWSNashville graphic for Thursday. Summary: Spotty chance of rain today under mostly cloudy skies. Tomorrow night/Friday early morning severe weather could keep us awake. 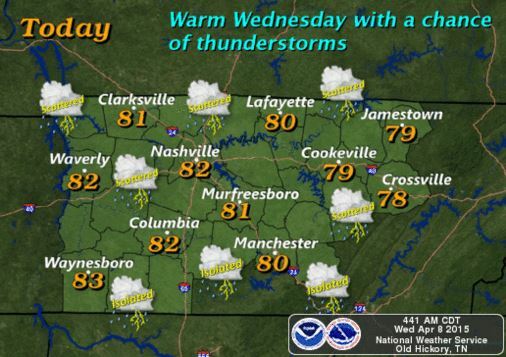 Today, we will see our highs jump to 82 degrees with a 20% chance of thunderstorms. Skies will be mostly cloudy with a hint of sun every now and then. Our winds will be pumping warm moist air from the SSW into the Mid State at about 10 mph. The chance of rain isn’t all that high today, but could develop a thunderstorm or two. Here is NWSNashville’s HAZARDOUS WEATHER OUTLOOK for today. While we are south of I-40, we can’t rule out that we won’t see one of those scattered storms thrown our way. The HRRR paints our greatest chance of seeing some rain in Hickman County at about 1-3pm today. The SPC does have us outlooked for THUNDERSTORMS today, but even that I think is too generous. Consider ourselves lucky if we do see a thunderstorm roll through the county today. Tonight’s low temp will fall to a very mild 65 degrees as our rain chances diminish only for a little bit. Thursday during the day our rain chances will be 30% (mainly after 1pm) while seeing temps climb to about 81 degrees. It will be partly sunny Thursday, with winds winding up to about 10-15 mph from the south southwest. Some gusts could see themselves to about 25 mph. Thursday after dark is when things start to get dicey in the Mid State. A strong cold front advances toward us from the west, bringing with it a chance of severe weather late Thursday night into early morning Friday. Our chance of rain increases to 80% while our temps will be around 58 degrees. This appears again to be a mainly large hail and damaging wind event, but can’t rule out an isolated tornado. 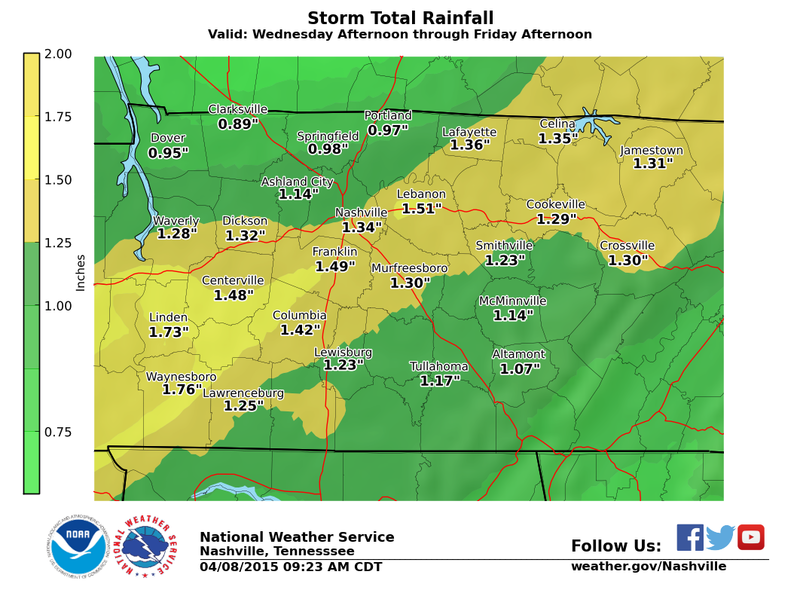 The NWSNashville has this to say about Thursday PM/Friday AM (updated 1:30pm 4/8/2015: updated below graphic). The SPC currently has us outlooked in the SLIGHT category for severe thunderstorms. Updated 1:30pm 4/8/2015: The SPC mid day Wednesday updated Thursday’s outlook for us and has placed us firmly in the ENHANCED outlook for severe weather (we updated the graphic below). 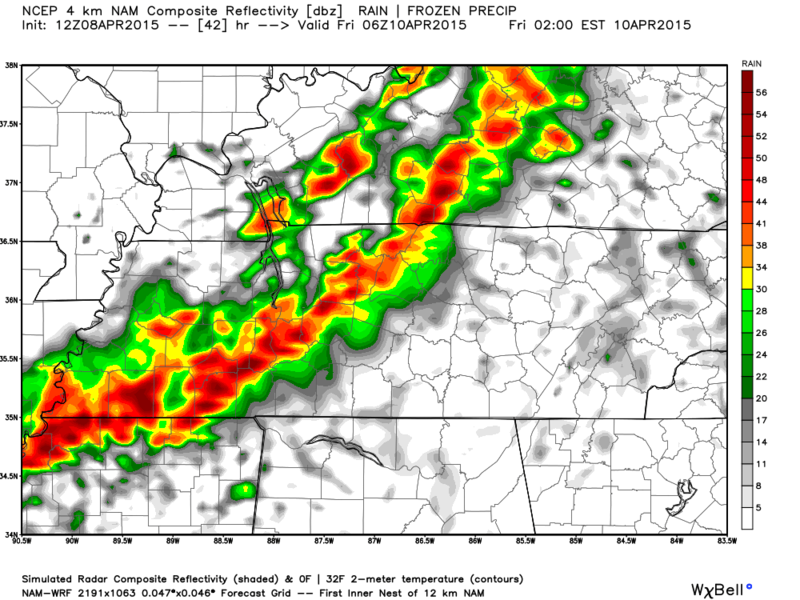 The current NAM4 model shows this storm is likely to come through Hickman County at about 1am Friday morning. The last few times I’ve looked at this model for this event, this timing hasn’t changed all that much, but that doesn’t mean it couldn’t come earlier or later by a handful of hours. The good news: these storms will be coming through after they have lost some of its energy from daytime heating. The bad news: these storms are coming through during the night, while people will be sleeping. (Keep those weather radios and phones close by while you sleep). Between Wednesday afternoon and Friday afternoon, we could be seeing up to about 1.5 inches of rain. The weekend will be a treat! Once the cold front and storms push through, we will be treated to a very pleasant spring-time weekend! Our temps for both Saturday and Sunday will be in the low to mid 70’s under partly cloudy skies. There is a slight chance of rain Sunday, however, but this is only currently at 30%.